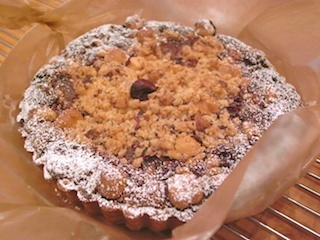 My favorite sweet is a tart of "Ristorante MINORIZUKI" in Kurashiki. I love it. "Ristorante MINORIZUKI" is ordinarily French restaurant you can eat homemade Pasta. Minorizuki's Madam bakes some special tarts once a month. I bought "a chestnuts and nuts tart" for my mother. Because last Sunday was a special day called "Haha-no-hi".